The Australian Academy of the Humanities is celebrating 50 years in operation and has curated a program of events to acknowledge the contribution of the humanities to understanding our past, make sense of the present, and consider the role that the humanities will play in humanising the future. AURIN is supporting this program through participation in the Humanities, Arts and Culture Data Summit and international DARIAH Beyond Europe workshop at the National Library of Australia in Canberra. The Academy believes that digital and big data developments are transforming the possibilities for research into Australian society and culture, enabling unprecedented inquiry into our history and heritage, our place in the region, and the way we live now and into the future. At this summit Jane Hunter, Director of AURIN and Dr Michael Rigby, Interim Deputy Director of AURIN and Data Relationships Manager took part in a series of interactive knowledge exchange sessions where speakers will critically reflect on themes and explore points of intersection and interaction, specifically areas in which the DARIAH community might build fruitful, long-term collaborations. Jane contributed to the moderated discussion “Overview of Australia: state of play and next five-ten years for digital humanities and arts” to identify common opportunities and challenges and seek out joint solutions for Australia’s humanities researchers. 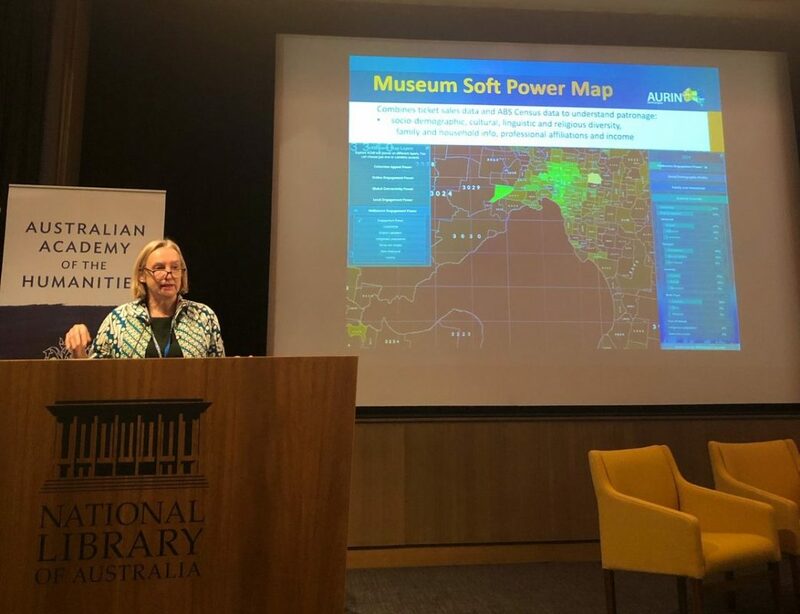 Jane promoted the work of Dr Natalia Grincheva, a Research Fellow of the Research Unit in Public Cultures at the University of Melbourne, where she collaborated with the Australian Centre for the Moving Image (ACMI) to develop the Museum Soft Power map, an online tool, supported by AURIN data, that maps and assesses the ACMI’s “attraction power” in Melbourne and abroad. Michael discussed the current state of georeferencing in the humanities sector, the process that enables the mapping of artefacts to a spatio-temporal footprint. This entry was posted in AURIN, Blog, Latest News. Bookmark the permalink.